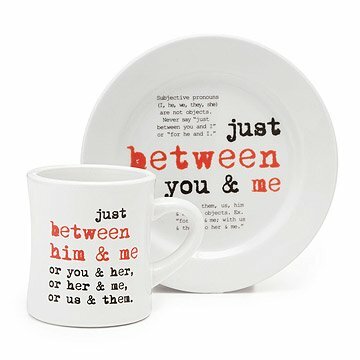 Serve a side of grammatical knowledge with these punchy plates. Dish out valuable lessons, such as the difference between "Lie" and "Lay." An A+ gift for English teachers, professors, and self-proclaimed agents of the Grammar Police. Made in the China printed in USA. Check out our coordinating Grammar Rules Mugs! Lee Knapp is a Virginia artist, writer, and high school history teacher. She decided to put her background in ceramics to work to correct America's grammar. Lee has authored a book of personal essays entitled "Grace in the First Person" and is writing a memoir about returning to her old high school to teach history, exploring the internal and external changes there and how they mirror those in American culture and society over the last thirty years. These restaurant-quality plates are each inscribed with quirky grammar lessons.